The Slot-A, and the SocketA, version of the AMD Athlon or Duron, are VERY good overclockable. I got my AMD Athlon 500 running at 700 Mhz and my AMD Duron 600 running at ... 900 Mhz !! That is pretty cool for a sub $150 CPU ! 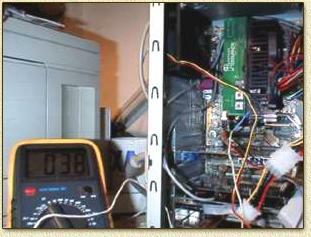 For the Slot-A AMD Athlon overclocking we used a so called "Gold-Finger" device. A little piece of PCB hooked up to the (hidden) gold-finger connector of the AMD Athlon. Which works great. 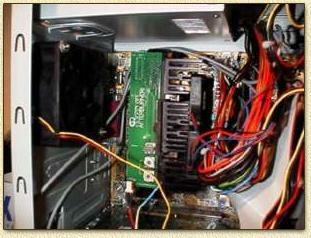 Overclocking the SocketA AMD Athlon or Duron does not require a "Gold-Finger"-device. The trick is cheaper but definitly harder to execute. Or better: it's a more precise excersise. Warning: Overclocking may harm your CPU, hardware and even wreck the data stored on your harddrive, so please read the disclaimer! I first started by ordering the OutsideLoop Afterburner. Alternatives are: FreeSpeed and Maximizer. These devices are often called "Gold-Finger"-devices, which make overklokken very easy. Next step was installing proper temperature monitoring software. The software that came with the Asus K7M mainboard was sufficient, but later I started playing with the nicer MB Monitor (it supports a lot of mainboards, check it out !). Next step: mount the Afterburner on the Athlon and put the Athlon back in it's mainboard slot. The first thing I tried was running at 500 Mhz with a VCore of 1.60 Volts. I figured the mainboard temperature sensor would not be acurate enough so I placed a heat sensor on the CPU for some serious temperature indication (which was actually about 8 degrees higher than the mainboard sensor indicated) . On should be able to go further, but the cache speed might need altering (succesfull clocking to 750 Mhz have been reported without altering the cache speed. Default cache speed is 1/2 (at 700 Mhz I used 1/2 too). Most 800 Mhz overclocking require a cache speed 1/3. For benchmarking I used SiSoft Sandra and 3DMark2000. Since I have 2 computers, I grabbed the oportunity to compare both systems. Initial I had a Intel Pentium III 450Mhz with a Creative Labs Annihilator (Geforce) which I overclocked (FSB = 105Mhz) to 500 Mhz. The other computer has an AMD Athlon 500 with a Voodoo3-3000, running at 700 Mhz using the OutsideLoop Afterburner. 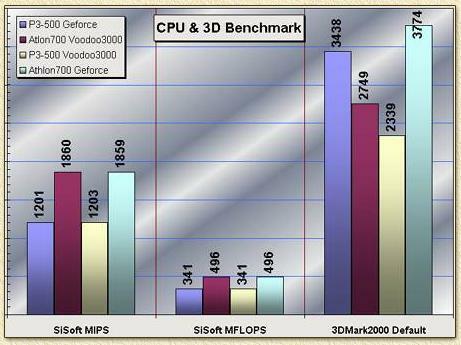 The Geforce definitly increases 3D performance and seems slightly depended on the type of CPU and CPU-Speed. The same goes for the Voodoo3-3000 card.